Vada's Blog Stamp Inks and Paper : Gingersnaps # 102 Twine Challenge. Gingersnaps # 102 Twine Challenge. Continuing Gingersnaps “Cowboy and Cowgirl Theme. Just got in my Grand Nestabilities, so I had to try them today. Using an Old West or “Out on the Prairie theme“, some Twine, a little Barbed wirer , Cactus and Longhorn made a fun little card. My stamp credits are Artistic Outpost, Hero Arts, Cornish Heritage Farms and Stampabilities. Labels: Cornish Heritage Farms, Gingersnap Creations Challenge ., Hero Arts. Oh my, Vada! This is quite a piece of art! Beautifully done! When I checked my message at BC and saw the top of this, I thought it was a pickle!! This is amazing! Love how you used the twine for the challenge! Have a great weekend! Your piece is just awesome, love the way you used the twine! I love your take on this challenge. How fun that the twine is wrapped around a cactus! That really turned out cool. I've been wondering about those Grands, do you really like them? So AWESOME Vad!!!! Love the theme and the barb wire and twine are the crowning touch!!! Fabulous use of twine, Vada! Totally stunning card! I am with Lynn - this is AWESOME. I've become a Follower so I don't miss out. Fabulous card... I keep wanting to use that notebook border punch. Perhaps today will be the day! Vada, this turned out great!! Very Wild West! I love the cactus with the twine around it - brilliant! Hi Vada... this is awesome. just love the windmill image and the use of twine is brilliant... awesome job ! Just wonderful, great Wild West feeling. 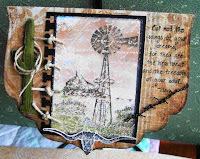 What a wonderful western scene ... love how you wrapped the twine around the cactus ... so glad you joined our Spicy Supply Challenge at Gingersnap Creations. Congratulations to you on being selected as a Ginger Gem, Vada!